Much has been said about the Mass Effect series (both good and bad) but I had yet to actually play it myself. Recently, I decided to buy the Trilogy package for the PS3 and play the entire saga back-to-back. 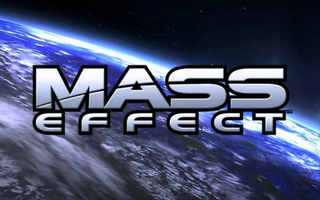 Today, I'll talk about my experience playing through Mass Effect 1, the game that started it all. Something that surprised me right from the start was the title screen. You know how there usually is the game's logo, a "Press Start" button and some legal information at the bottom? "(c) 20xx Super Company. All Rights Reserved" and so on? Well, after a few seconds, the legal text and company logos disappear, so that you can enjoy the view of Earth from outer space. Together with the beautiful music that is played in the background, it's a title screen that puts you into a melodramacic mood even before the actual game starts. In the same way how the Metroid Prime 1 main menu theme gives you a "this is an ACTION game!" vibe, ME1's title screen gives you a "this is a DRAMA game" vibe. The second big surprise came in the form of the combat system. Most of the Western-made RPGs I've played have a tactical, at times turn-based, combat system. Those that have a real-time combat system usually are set in a medieval setting, so it's mostly swords/bows/magic. And even those have some strong D&D roots, and ultimately the stats and equipment (and a touch of strategy) are more important than reflexes. But this game has guns - lots of guns! You have your standard set of weapon (pistol, assault rifle, shotgun, sniper rifle) as well as biotics (Mass Effect's version of magic, to keep it simple). These weapons and abilities are being used in real-time, and you actually have to aim with them, just like in other third-person shooters. All of the weapons, biotics and other special abilities are usable an unlimited number of times, with only weapon overheating and cooldowns giving you a break from the action. It's a brilliant setup, as it creates a good balance between the importance of individual gear and your stats, your real-time shooting skills, and the right timing of using your special abilities. Since you can change the combat difficulty at any given time, the game becomes accessible for both the story guys, as well as the action guys, and anything in-between. Despite the bold move made with the combat system, the game still is a traditional BioWare RPG with some great dialogue, and A TON choices. When talking, you can either ccept or decline an offer, answer in a polite or jerky manner, ask for some background details, or just skip everything and get straight to the violent answer (aka combat). Usually you can still get the same result at the end of a situation (which is, you win), it's just a manner of how nice/how much of a jerk you are. You can also say "no" and decline an offer, though, even if that means missing out on a side quest. But it's not just witty remarks you can make, though. You also have to make decisions - a lot of decisions! It is one thing to decide whether you let a thug go or arrest him. But whenever something big is at stake, you have to make a decision just the same. And trust me, this game WILL make you think long and hard about these decisions. Separate from all that is the morality system, which is more personal and anecdotal than in other games. Instead of being drawn to the good or bad side, your morality is merely pointed out by other people, but the guys in charge still give you a mission briefing, even if you are a big jerk. Overall, the game allows you to be yourself. You can be a perfect saint or devil, but anything in-between is also possible. It's more flavor than law, if that makes sense to you. About 3 or 4 hours after the beginning of the game, you're being given control of your own ship. You can then travel to other star systems and check out dozens of planets. I repeat: You can explore the galaxy! There is a star map which shows the entire Milky Way. You select a star system and planet, and your ship will fly to the destination. The majority of the planets you can find are just for show, though. You can select them and read their description, and maybe find some minerals or relics for one of the collection sidequests, and that's it. On about a dozen planets, however, you can actually land with an armored vehicle and explore a small portion of the planet's surface. The terrain is mostly cliffs and mountains, so you have to do a lot of climbing. Fortunately, your vehicle has Skyrim horse power which allows you to climb almost all cliffs, so the driving part is not too frustrating at least. Some locations are marked on your map, so finding any sidequest-related facilities is never an issue. However, if you plan to check out all the optional markpoints, as well as try to find all the unmarked mineral patches and other collectibles, it can become quite tedious. Worse yet, this type of planetary exploration is the only type of exploration Mass Effect has to offer. Outside of the central hub and five other planets with unique locations, everything else is just "hiking to the max". The sidequests themselves are varied and pretty good in general, so they can compensate for any copy&paste feeling you might develop over time. Just don't expect a ton of unique landscapes like in Skyrim or GTA. Then again, why the heck am I even comparing this game to these giants? Just make sure not to explore all of the planets all at once, and take a break from time to time. All of the advanced technology within the game is being made possible by the fictional "element zero". This element can change the mass of any other material, making it as light or as heavy as necessary. This is called the "mass effect" (now you know why the games are called that way ;). Space travel is possible only because a ship can be made very light, so you don't need a ton of fuel just to push it forward in outer space. All of the weapons also use the mass effect, changing the mass of the ammunition and accelerate it at high speeds to create a rail gun effect. Artificial gravity is being crated by this effect as well. There also are some giant relays, which allow for near-instantaneous travel between two star systems. Going from one end of the milky way to the other becomes possible thanks to those. The mass effect, together with all the alien species, are the fictional part of the game. Outside of that, however, everything else is explained in a reasonable manner, often supported by scientific facts or existing cultural examples. Whether it be the biology, history and culture of the various species, space combat, galactic politics or other types of technology - it is all explained in-game in a reasonable manner. Even the various planets you can discover have all their unique habitats explained with a handful of lines. Little is left unexplained and just exists for the rule of cool - no, Mass Effect is a story universe that is very-well explained. As a result, you can relate to the various social, cultural and political plotlines, despite the fact that this is a whole new world (well, universe really) you're being exposed to. Bottom line, the worldbuilding in this game is superb. Overall, Mass Effect is a great game. It is a great introduction to the overall story universe, and while the main storyline is a bit short, it makes up for it with all the optional stuff, as well as the wealth of background information. You're here to explore the universe, to get used to it for any future titles, and in that the game succeeds. Gameplay-wise, the game features the same strong decisions from other BioWare games, but the real-time combat makes it both a bit more dynamic, and more accessible. It still has some KOTOR elements in it, like with the stats and equipment, but it's also making some bold choices to create its own identity. While the sidequests are good, it has a touch too much reused environments for my taste (and no optional unique locations for that matter). But considering it was BioWare's first 7th console generation game, I don't blame them for being conservative with the game's assets. It's a good start, and the story is the real hero here, so I don't mind not having a GTA-level of optional content.